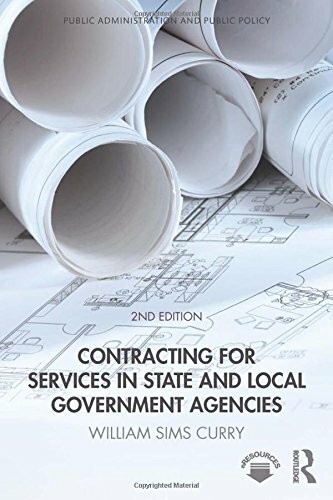 This second edition of Contracting for Services in State and Local Government Agencies provides state-of-the-art tools for best practice in the procurement of services at state and local levels, from initial stages through to completion. Including lively case studies and research conducted with state and local agencies across the United States, this book provides management advice and tips on compliance to reduce costs, select the best-qualified contractors, manage contractors’ performance, and prevent corruption and waste. Utilizing the results of new research in all fifty states, author William Sims Curry offers updated best-practice documents, methodologies, and templates including: a Request for Proposal (RFP), a scorecard for proposals to select the best-qualified contractor, a toolkit for meeting socioeconomic contracting goals without compromising price, quality, or on-time delivery, and a Model Services Contract (MSC). Special consideration is given to obtaining services and products in states of emergency. Several additional resources for practitioners are available online, including sample contracts and a straightforward, inexpensive tool for tracking contractors’ progress and cost management. The roadmap and templates contained in this book and available online to readers will prove essential to state and local government agency contracting professionals and other officials and employees called upon to participate in the drafting of solicitations, writing sole source justifications, writing scopes of work, serving on advance contract planning and source selection teams, recommending award of contracts, or assisting in the management of those contracts.